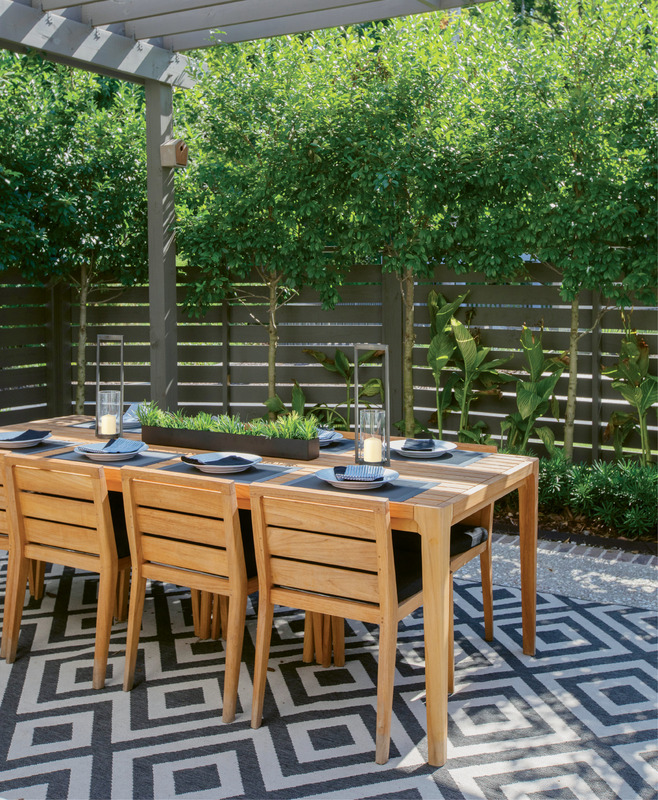 Limbed holly bushes soften a horizontal wood-slat fence, providing privacy as well as filtered light for the Thomae family’s alfresco dining room. After making an offer on another house in Mount Pleasant stumbled upon the Fulton neighborhood and a home that checked all the boxes on their wish list: new construction; proximity to downtown and good schools; an unfussy, modern design; and a welcoming vibe. 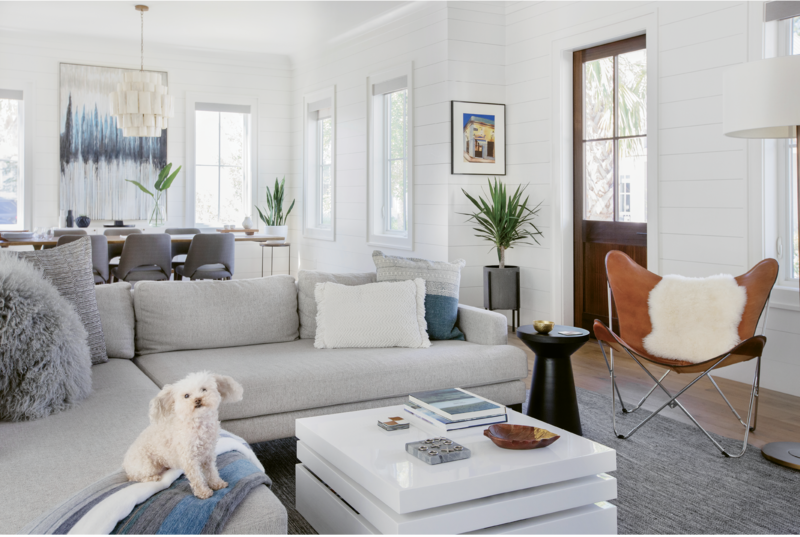 Wide-Open Spaces: Shiplap walls painted in Benjamin Moore’s “White Dove,” oak floors, and reclaimed beams set the stage for the open living area, including a cozy sectional sofa from West Elm where Mia the Maltipoo relaxes among pillows from Lyndon Leigh. In the streamlined kitchen, seamless cabinetry on each side of the expansive marble-topped island holds everything from cookware to craft supplies, as well as a built-in beverage cooler for kids’ drinks. To the right of the chevron-tiled backsplash, a walk-in pantry houses cooking staples and the wine bar. Sit a Spell: Most mornings—post-school-drop-off—find Tracie in the light-filled dining room reviewing images and reading magazines. The oak table is from Anthropologie, and the resin-covered banana-bark chandelier from Candelabra. Fun Zone: Three sliding glass doorways open to the outdoor entertaining areas, including a lounge space with aluminum and teak love seats from AllModern and a woven lantern from Lyndon Leigh, Cristian’s “kitchen,” a compact pool where the boys and goldendoodle Kylie splash and play, and the pergola-covered dining area with a teak table and chairs. 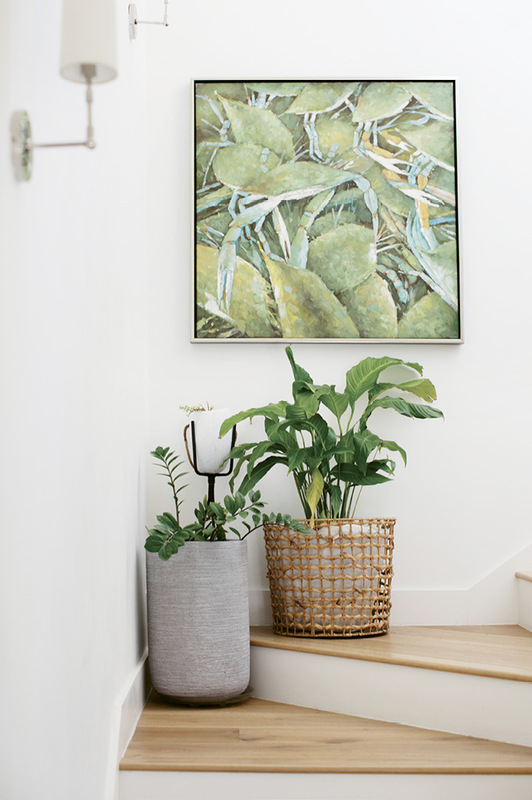 Coastal Living: Hanging in the stairwell to the boys’ rooms, the painting of blue crabs came from their home in Augusta: “I guess we were always aiming for the coast,” Tracie says. Serene Wing: Spare, modern lines continue in the first-floor master “wing” complete with 10-foot vaulted ceilings, his-and-her walk-in closets, and a laundry room hidden behind the reclaimed wood sliding door. 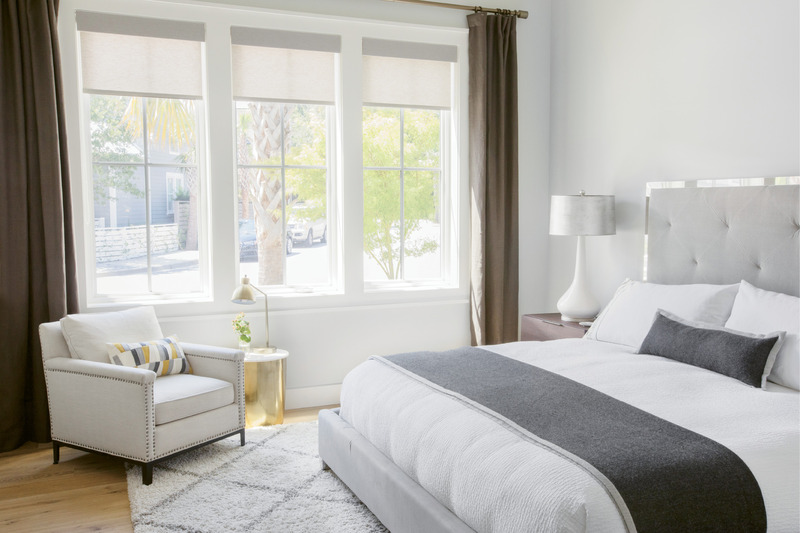 Furnishings are a blend of older favorites with new pieces, such as the low-slung upholstered linen bed from AllModern. R&R: In the master bath, a large soaking tub overlooking the backyard separates his-and-her marble-topped vanities. An expansive shower with frameless glass and penny marble tile completes the retreat. JUST RIGHT: After making an offer on another house in Mount Pleasant, Dr. Cristian Thomae and his wife, Tracie (inset), stumbled upon the Fulton neighborhood and a home that checked all the boxes on their wish list: new construction; proximity to downtown and good schools; an unfussy, modern design; and a welcoming vibe. Sometimes, finding home requires making a U-turn. When a job offer from MUSC brought Dr. Cristian Thomae and his family to the Lowcountry from Augusta, Georgia, in 2014, the ob-gyn and his wife, Tracie, immediately set about finding the best address for their active crew. With three boys heading into elementary and high school, the couple knew they wanted to live in an East Cooper school district, and “We like new construction,” Cristian says. However, consideration also needed to be given to his downtown commute and her preference for an unfussy, modern style. After an initial search that shifted from the north end of town towards Old Mount Pleasant, Cristian and Tracie came across an ostensibly perfect place close enough to the Ravenel Bridge and new enough to fit the bill. On a Sunday afternoon in late 2016, after confidently putting in an offer for the house, the family piled into the car. Little did they know that drive would drastically alter the course of their house hunt. “We were heading up Highway 17 when I spotted a bright orange sign touting ‘unique modern living’ and happened to comment on it,” recalls Tracie. Much to her surprise, Cristian turned around at nearby Boone Hall Plantation and swung into the Fulton neighborhood. There, they discovered just five spec houses and a handful of lots, but they spied plenty of potential. “Despite being close to one another, the houses were oriented to maximize privacy, with windows and porches strategically placed for discretion,” explains Cristian. 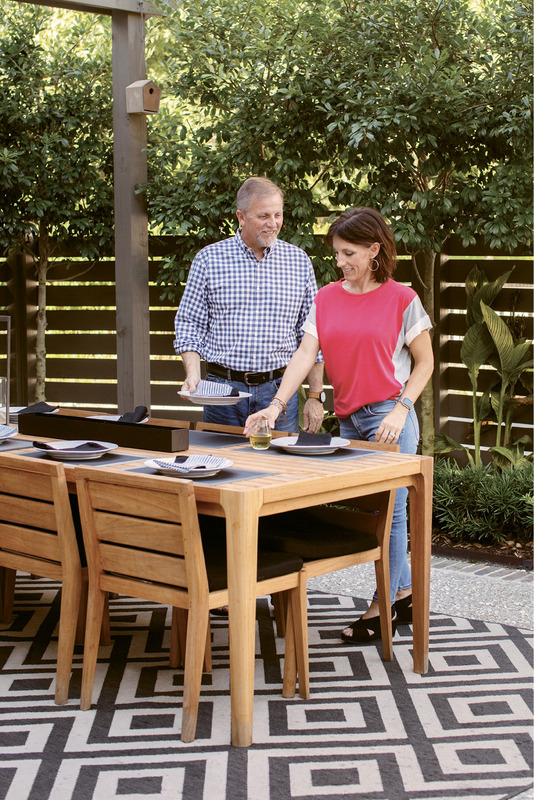 “As we toured the neighborhood, the homeowners were welcoming and social,” says Tracie. “I’ve never lived in a big city, but I feel like that’s who I really am.” The would-be urban dweller was excited to see that Fulton promised the community element that she and Cristian wanted from their new hometown. 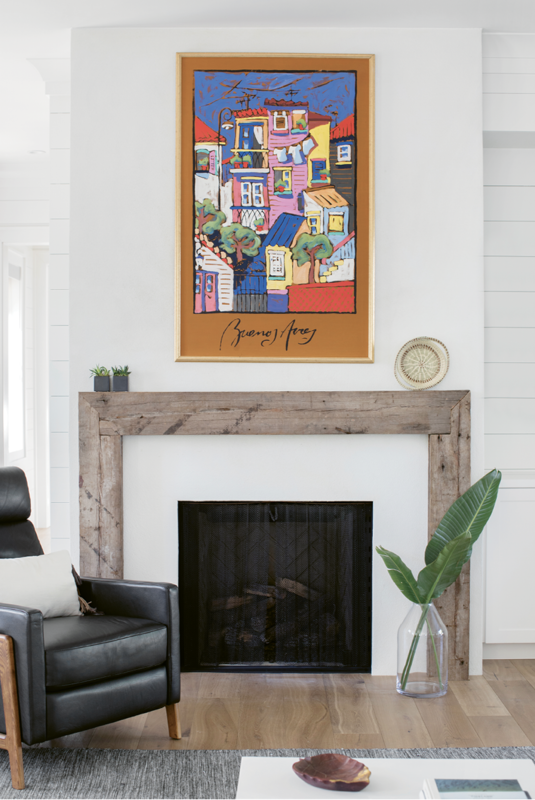 When the potential buyers attended a neighborhood gathering just a few weeks later, they were introduced to a close-knit mix of neighbors hailing from Brazil, Ecuador, and Cristian’s native Argentina. Though he first hesitated to settle so close to a busy highway, a bit of research confirmed that he didn’t need to be concerned over poor air quality and traffic noise, two downsides of growing up in bustling Buenos Aires. 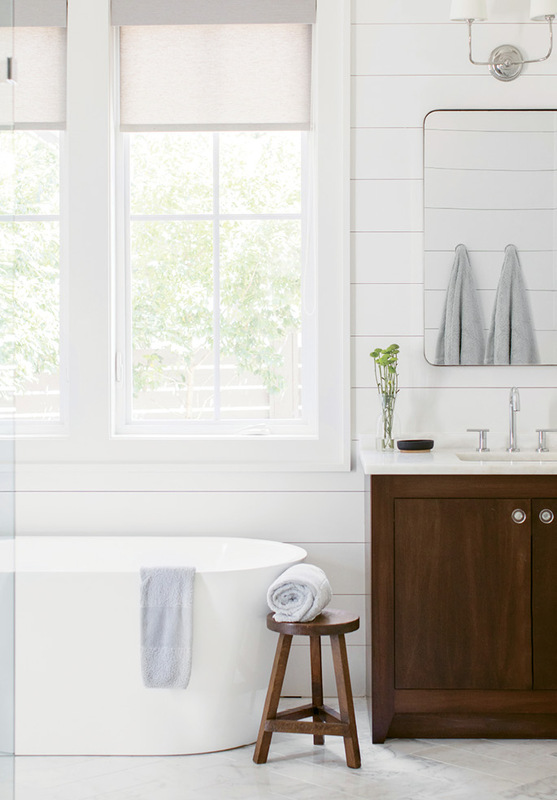 Now, a light palette of whites and grays unites the space, which leans on angles and texture for interest. 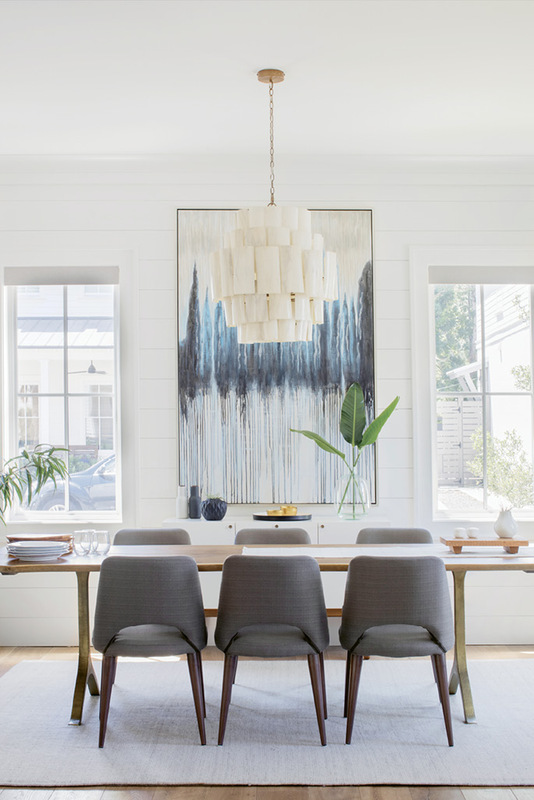 Against a backdrop of shiplap walls (painted in Benjamin Moore’s “White Dove”), natural finishes such as engineered oak flooring and reclaimed ceiling beams, leather- and canvas-covered seating, a banana bark chandelier, and a muted wool area rug provide warmth. Nods to Cristian’s heritage can be found in a leather butterfly chair that the pair purchased while visiting Buenos Aires and in the artwork, which includes painterly watercolors made by Cristian’s father, Maurice Thomae, in the 1960s and ’70s. 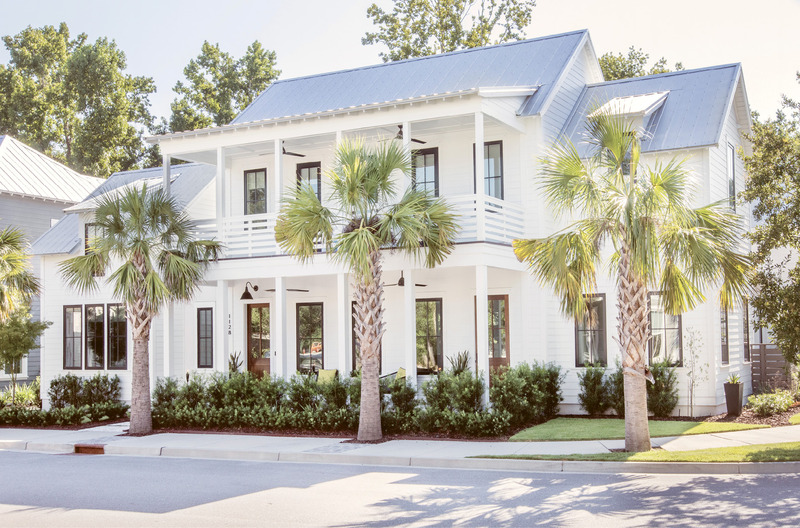 At 3,000 square feet, the completed residence is significantly smaller than any of the Thomaes’ previous homes, though 10-foot ceilings provide an airy sensibility. “It still feels as big as our previous [5,000-square-foot] house,” remarks Tracie, “because there’s no wasted space. All of the rooms are used and functional.” With design input from Lana Damjanovic, who co-owns Fulton developer Alka Construction with her husband, Branko, the finished home boasts clever storage and smart solutions that maximize the livability of each room and eliminate everyday clutter. 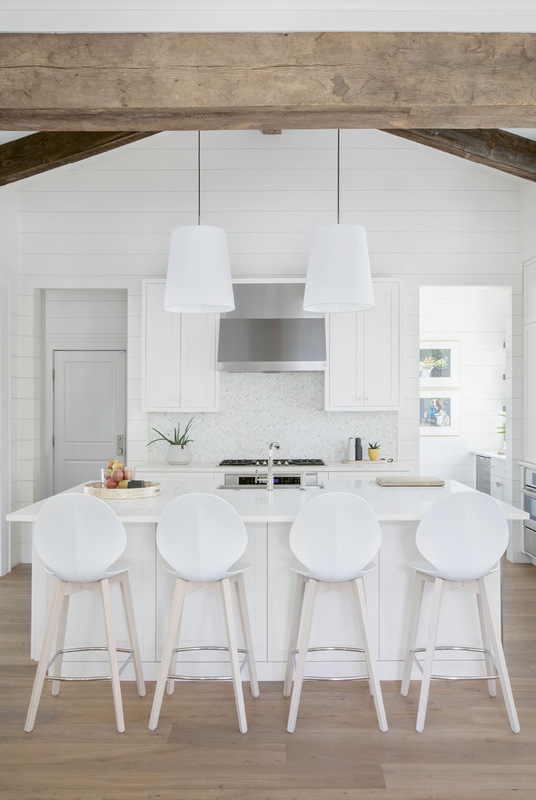 In the kitchen, an expansive central island harbors seamless cabinetry along every face to house not only cookware and small appliances but also a built-in beverage cooler for stashing kids’ drinks. Tucked in front of sleek armless counter stools, four hidden cabinets corral craft supplies and other goods that needn’t be accessed every day. A side cupboard contains a compartment for the built-in coffee/espresso maker and a rollout shelf to hold mugs. 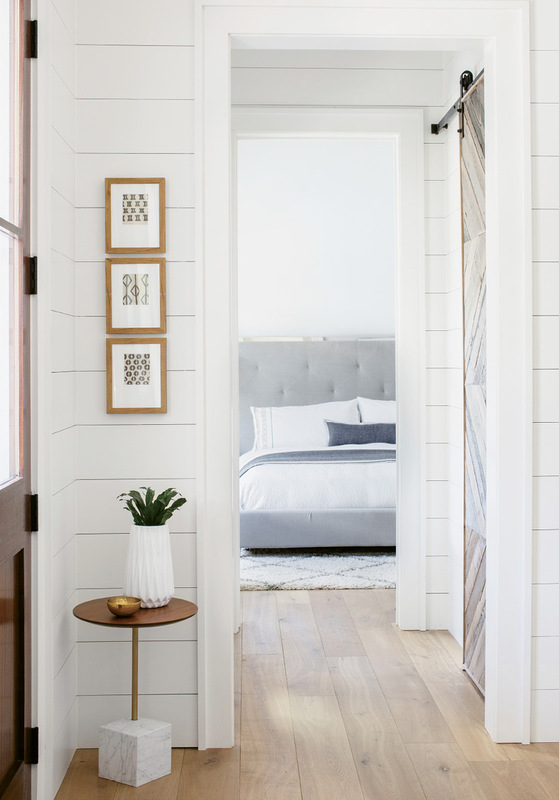 Electing to slim down the size of the rear pantry freed up square footage for a closet-size home office from which Tracie can manage household to-dos and her wedding and portrait photography business. Another adjustment the couple made to the original plan involved enclosing what would have been a separate outside entrance to a mother-in-law suite, resulting in a divided but functional second floor. The main staircase leads up to a kids’ retreat with bedrooms for Miles (age nine) and Christian (12), a shared bathroom, and a dual-TV/playroom that would make any young gamer swoon. On the backside of the house, the now-enclosed rear apartment serves as a bedroom for 18-year-old Aaron. Outfitted with hooks, cubbies, and a storage bench, the base of this secondary staircase acts as a drop zone for the avalanche of backpacks and sports equipment that comes with three school-age boys. As the first-phase plans for Fulton came together, the Damjanovics made certain to incorporate manicured courtyards and green spaces. The Thomaes’ home wraps around a well-appointed backyard divided into “rooms,” including a covered tabby porch, heated pool, and step-down dining pavilion. To gain additional privacy, Tracie created a green screen with holly trees that have been limbed up, introducing filtered sunlight. Bridging the interior and exterior living spaces, two of the porch’s three walls feature triple sliding glass doors. With those panels fully open, the kitchen and living room become an extension of the backyard, creating a prime entertainment space. Along the porch’s far wall, Cristian envisioned a wood-fired Argentine grill as a focal point for hosting authentic asados (barbecues), but he and Branko had concerns about the sizeable chimney needed to ventilate such a large grill pit. 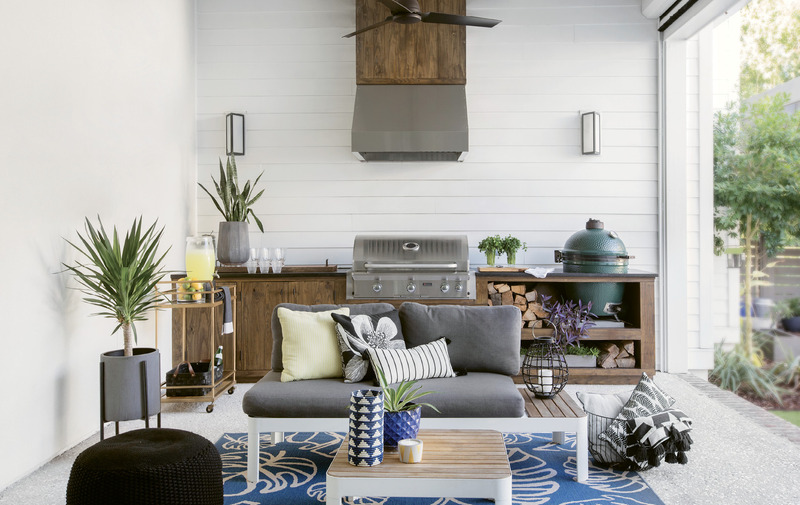 So they opted for the next best thing—a built-in gas grill and ventilation hood with a Big Green Egg charcoal cooker nestled alongside. 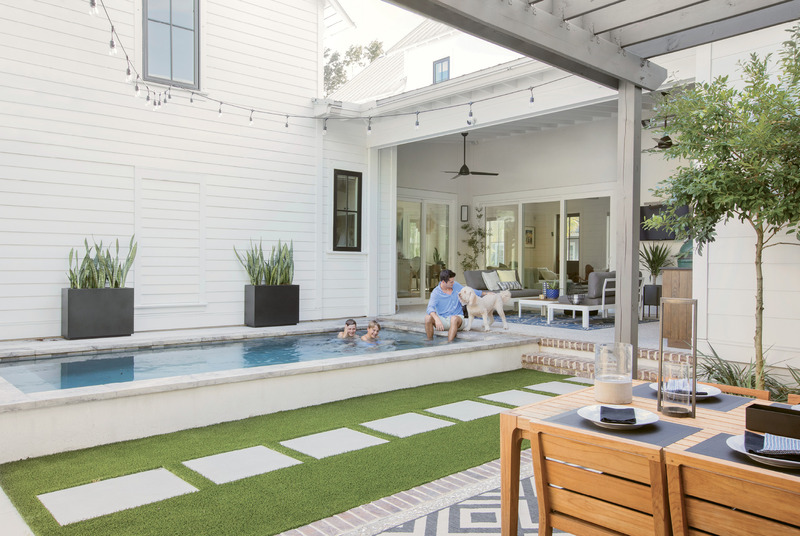 For year-round functionality, a drop-down screen along the open fourth “wall” offers protection from the Lowcountry’s summer pests, and wall-mounted heaters keep winter’s chilly temperatures at bay. Family and friends often congregate here in the evenings and on weekends to lounge on the outdoor love seats while Cristian works the grill. And those first welcoming faces that the Thomaes met when they stumbled into Fulton have become regulars. Thanks to a propitious U-turn made late one Sunday afternoon, this outgoing family has discovered that a great neighborhood isn’t defined by school zones or amenities or lot size, but rather the neighbors who call it home.